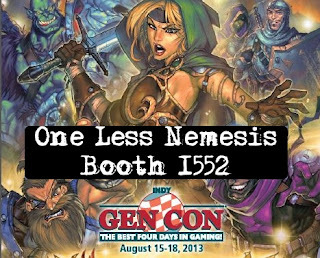 One Less Nemesis Blog: D&D or Settlers of Catan? Help us design our new gamer shirt! D&D or Settlers of Catan? Help us design our new gamer shirt! We are going to be in the vendor hall at GenCon Indianapolis for the first time ever August 15 to 18! We are stoked for this event and our chance to meet all of the gamer fans who come from around the globe to take part in the biggest event in gaming. To celebrate our first GenCon, we are designing a new game inspired t-shirt. We've gotten great suggestions for two different tees: A Dungeons & Dragons design and a Settlers of Catan design. We need your help to decide which one you think would be the most popular and sellable design at the show. Take our poll and help us out! Help us design our new gamer shirt! Dungeons & Dragons or Settlers of Catan?